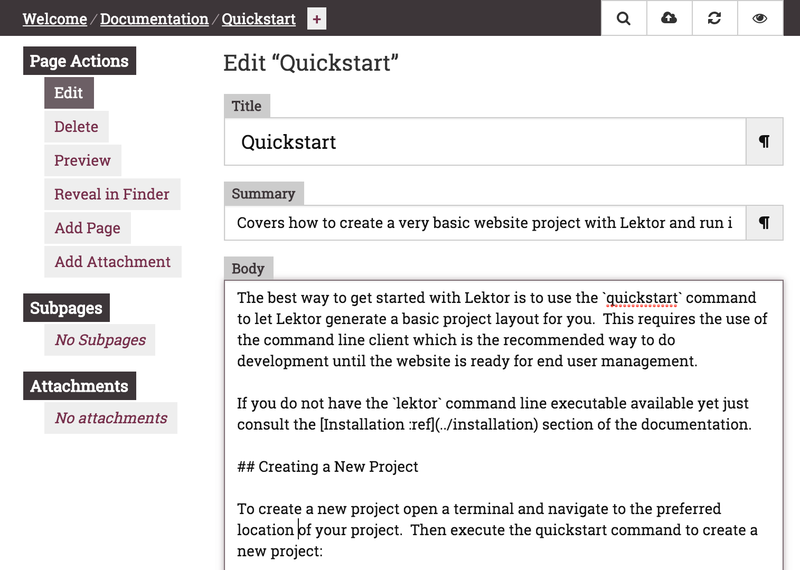 The best way to get started with Lektor is to use the quickstart command to let Lektor generate a basic project layout for you. This requires the use of the command line client which is the recommended way to do development until the website is ready for end user management. If you do not have the lektor command line executable available yet just consult the Installation section of the documentation. This will ask you a few questions and then create a new Lektor project with some basic configuration for you. Now that you have a project you can run it. As a developer the easiest way to do that is to use the server which runs the project on your local machine as if it was a dynamic website. This will automatically start the server and you can navigate to localhost:5000 to open the project. You can keep the server running, it will automatically rebuild your files as they change. While the development server is running you can use the built-in admin interface. It can be accessed by clicking on the pencil symbol on a page or by manually navigating to /admin/. When you want to build the website for distribution you can make Lektor build everything into static files. In fact, that's already happening in the background while the development server is running. If you want to trigger a build you can use the build command. By default it builds into a lektor cache directory. All your generated files will end up in that folder for easy publishing. The Guides which cover common setups. The Deployment Documentation which shows how to deploy a website to production. Data Modelling for everything about how to model your data. This website is built on Lektor as well. You can find the sources of it on GitHub and you can click at any point on the source symbol () on the bottom to see the source for the current page.